Brussels Airlines history dates back to 2001, following the banckruptcy of Sabena, when parts of the former airline was reorganized and flew under the name Delta Air Transport (DAT). A few months after the bankruptcy of the flag carrier, DAT, the regional airline, was rebranded as SN Brussels Airlines (SNBA) keeping the Sabena flight numbers and aircraft livery to remind its link to the defunct Belgian airline. DAT was operating short and medium-haul flights exclusively on behalf of Sabena, using a fleet of BAe146 and Avro RJs. Three Airbuses A319 were added to the fleet to extend its network. At the same time, private investors created a new company, Birdy Airlines, which exclusively operated long-haul flights to Africa. They were using three former Sabena Airbuses A330, mainly crewed by former Sabena pilots. In 2004, Birdy and its staff were integrated into SNBA to feed the medium-haul network. Brussels Airlines was created in 2007 by the merge of SN Brussels Airlines and Virgin Express. Virgin Express (VEX) started in 1996 after Sir Richard Branson acquired Euro Belgian Airlines (EBA) with a fleet of Boeing B737-300/400. 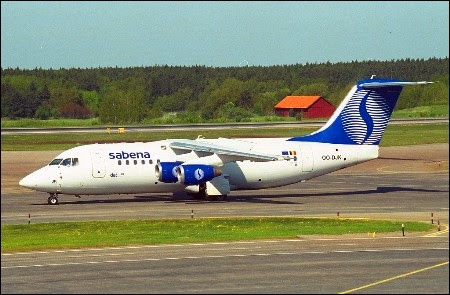 VEX also operated scheduled flights on behalf of Sabena. In 2008, Brussels Airlines was integrated into the Lufthansa Group and the Star Alliance in 2009.